Mom's Gone Bronson! : Gardein Meatless Products; Review AND Giveaway! Ends Sept 16th, 2013! Gardein Meatless Products; Review AND Giveaway! Ends Sept 16th, 2013! My husband and I are not strict vegetarians but we would prefer not to eat meat rather than eating too much of it and so we tend to stick with many different meat-free alternatives and recently came across a company called Gardein. Garden + Protein gives Gardein its unique name and their products give you a unique taste of meatless products that EASILY replace any meal you might have considered irreplaceable when using a meat free option! This past week, the folks over at Gardein were gracious enough to send over a few coupons for some free products so that I could share with you my thoughts on what they had to offer and I had a hard time trying to choose what to share with you all! Eventually I went along with BBQ Skewers, Tuscan Breasts and Herb Dijon Breasts and I am happy to say I was not disappointed with the products I chose! I really do love a good meat alternative and so I was quite excited to try these and dipped in to the Tuscan Breasts first of all! I whipped up a batch of rice, lightly fried the Tuscan Breasts and added the sauce as recommended! I served the breast simply on top of the rice and VOILA! A quick, no-nonsense light meal! The breast was tender, tasty and not at all chewy! It did give me the feeling of eating chicken, even though I knew it wasn't chicken at all I don't think I would really have noticed if someone else had made it for me - I would have assumed it was chicken! My 16 year old, who LOVES chicken, tried these and thought they were fabulous, too, so they have a lot of potential to become staples in our household for sure! I next served up the BBQ Skewers and served these, again, on a bed of rice, but with veggies to the side and salad. They were also very delicious and gave me the feeling you might get when eating actual meat skewers and my husband ate them, too with zero complains! They went over very well and I would most definitely pick these up again! Lastly, I made the Dijon Breasts, which I absolutely adore, but tried cooking differently compared to the first round of breasts that I had cooked, just to see if it might make any sort difference in presentation or taste! As it turns out, the difference was minimal, the taste was very much the same (as far as the breasts themselves were concerned) and the sauce was delectable! I loved the tangy flavor and could have eaten these all day, which is just as well they came only in a pack of 2 and not a pack of 12!! I have to say that I am completely blown away by the quality of each one of these products individually and love the line as a whole and Gardein really has made it to the top of my list of wants [and will-buys] for the future! I think they put a lot of thought and effort into their products and the taste factor is just phenomenal! You HAVE to try at least one of everything if you ever get the time!! Speaking of which! Why not: TRY THEM FOR YOURSELF and ENTER TO WIN! That's right! Giving these products a shot could be easier than you think and the good folk over at Gardein would be delighted to offer one of you the chance to try some of their products for FREE!! 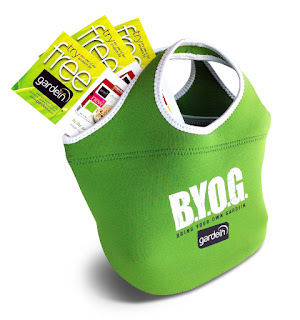 Gardein is offering 3 FREE product coupons and a gorgeous, green neoprene lunch bag to ONE of our readers and will ship these right to your door so that you can run down and pick the goodies to try at your closest store! All you have to do to be in with a chance of winning this FABULOUS prize is enter via the Rafflecopter below! - The giveaway will run for 10 days from 6th September, 2013 up until 16th September, 2013, at which point one winner will be chosen and notified via email! The winner will have 48 hours to respond to that winning email before their prize is forfeit and we pick another winner until we get a response to that mail! All entrants must be 18 or over, or have parental permission to do so! You must also live in the U.S and may enter as many or as few of the entry options as you like - nothing is mandatory, but the more you do, the more chance you have to win!! It is THAT simple! What are you waiting for! To discover more about Gardein [and everything they have to offer], why not check them out over at their website, which you may find HERE! You may also like to visit them on Twitter, HERE and Facebook, HERE to get informed and to stay connected with a brand I think you're going to adore! Have you tried these products in the past or love a good meat-free option you're dying to tell us about!? Why not let us know in the comments below!! Don't be shy, we LOVE to hear from you! Good luck, and ENJOY! - MGB. Disclaimer: I was provided with coupons to try these products for the sake of this review. My opinions are 100% honest and my own - your views may differ! Mom's Gone Bronson is not responsible for the fulfillment of this prize! Thank you! The Tuscan Breasts look really good. I would most like to try the Dijon Breasts. We love Gardein products! I've never had one I didn't like! I think we'd like to try the BBQ skewers best of the 3 you reviewed! the bbq skewers sound great, since i don't eat red meat!